I like this cd/dvd, contrary to the Shibuya Mutation this cd/dvd incorporates recent songs. I Don't like that this dvd doesn't have songs like "transformer dream again", "never ending road", "don't give up", "take my soul forever", classics' Psychic Lover. 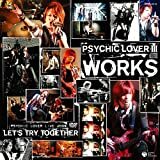 With this cd I have complete theme songs, I like it a lot "Shining magic machine", "Winter song", "Take my soul forever mix".